With the official launch of iOS 11 this week, Apple has introduced more PC-like capabilities to its mobile devices – especially the iPad – so workers can more often use them for daily tasks. While that's good news for companies focused on a mobile-first strategy, what could be an even greater boon for business is iOS's native augmented reality (AR) play, via its ARKit SDK. While Apple's AR move may appear at first blush to be focused on consumers with animated emojis and masks, native AR toolkits open up a world of possibilities for business users and app developers, according to IDC analyst Bryan Bassett. ARKit is purported by Apple to allow for "fast and stable motion tracking," which should make virtual objects look more realistic as they appear in a physical space, enabling them to sit flat on tables and other surfaces. Applications such as language translation, navigation and spatial awareness, contextual blueprints and manuals are all currently the focus of many AR software platform developers, none of which are aimed at consumers, according to Bassett. Allowing businesses to leverage AR with devices they have already invested in and deployed – namely iPhones and iPads – will only add to AR's growth in the enterprise. "Retail, manufacturing and field workers have a lot to gain through the use of AR; so making ARKit native to iOS going forward will only bolster AR's credibility in the workplace," Bassett said. Various industries have already experienced AR's possibilities through the Windows HoloLens ecosystem and early on with ARKit brands, such as Ikea and Kohl's, said Carolina Milanesi, an analyst with Creative Strategies. Both retailers have used ARKit to allow consumers to fit furniture or other items in their home before purchasing them. An example of iOS 11's AR capability. A virutal table and chair placed on a backyard patio as viewed on an iPhone. "Blending digital and real appeals to verticals such as ecommerce and travel as well as health," Milanesi said. While AR is something many enterprises are exploring, it is also a technology that most companies have no idea how best to exploit, according to Jack Gold, principal analyst at J.Gold Associates. While training and some service operations seem like natural fits, it's not as easy to deploy as it should be, Gold said, and it's also not clear what the best ergonomic deployment would involve – a phone or some form of headset/glasses. "While ARKit does provide enterprises with a way to develop AR solutions, they would be targeted at the iPhone environment, and not all companies think that's the preferred solution," Gold said. "A cross-platform capability would suit them much better, although the Android solution (ARCore) is also proprietary at this point. And you will see other vendors of smartphones join in the fray by introducing competing products to Apple's over the next 12 months." In January, the next CES conference will likely see a slew of new AR platforms, including Microsoft's versions based on Windows 10, Gold added. While the consumer market takes weeks or months to develop new applications for AR, the enterprise space is far more deliberate. So while there may be a few examples of enterprise AR pilots in the near term, there isn't likely to be anywhere near a critical mass of adoption over the next two years, Gold said. "And few enterprise solutions are stand-alone – having to connect to existing systems means time to integration and degree of difficulty is something that needs to be addressed," he said. "For companies investing resources in business process automation that AR could help with, failure is not an option they want to contemplate, so most will go slow." The bottom line: while ARKit might make sense for some companies looking to step up to AR capability, Gold said it's not yet clear how they can best exploit the capability based on a smartphone-only solution or even with a tablet like the iPad. Apple's continued push to partner with key software service providers ensures that iPads and iPhones will continue to come to work as BYOD options and will lead to a strong engagement with users "that is embraced by the IT managers," Minanesi said. To be certain, Microsoft still dominates the office desktop and laptop arena. Apple has found its enterprise play squarely in mobile, and as more companies embrace a mobile-first strategy, the adoption of mobile devices for desktop uses will expand. "Consumer technologies are becoming the leading platforms in the enterprise market, bringing additional capabilities to enterprise apps and Apple is riding that wave to get adoption in the enterprise," said Van Baker, a research vice president at Gartner. "Every enterprise worker is also a consumer." Because iOS 11 is more workplace-friendly, it is considered a bigger target for EMM vendors than past releases that, while offering the same capabilities, were more difficult to use. With iOS 11, Apple added a Dock on the iPad that allows as many as 15 apps to be quickly accessible from the home screen or when an application is running; it also added new multi-tasking features that include the ability to swipe between running apps – a function similar to a macOS Mission Control feature. The updated mobile platform also offers a system-wide drag-and-drop feature that enables users to perform tasks, such as grabbing data from an Excel spreadsheet and dropping it into a PowerPoint presentation. iOS 11's drag and drop capability. While previous versions of iOS offered similar functions, those tasks required multiple steps, and the complicated steps didn't always play well with a mobilized workforce. "With older versions of iOS, you could mobilize back-end applications onto it, but having the applications there is just one step. Being able to navigate, manipulate and jump around in an application, that's something else," said Kevin Burden, vice president of Mobility Research & Data Strategy at 451 Research. "No one wants to cut and paste on a mobile device, but drag-and-drop on a mobile device – that's a lot easier." Apple also improved the way its iPhone and iPad handle file management by allowing users to organize data and documents via its new Files app, which is similar to the macOS desktop Finder. 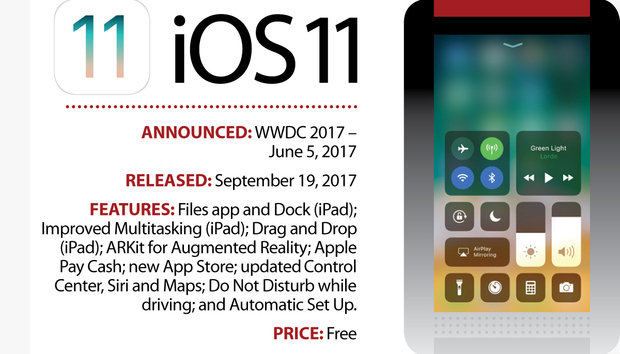 Bassett agreed with Burden, saying the two biggest additions in iOS11 that will appeal to enterprise users are drag-and-drop and the Files app. "One of the main drawbacks to using an iPad as your primary device was the lack of [a] comprehensive file library or method of file navigation," Bassett said. 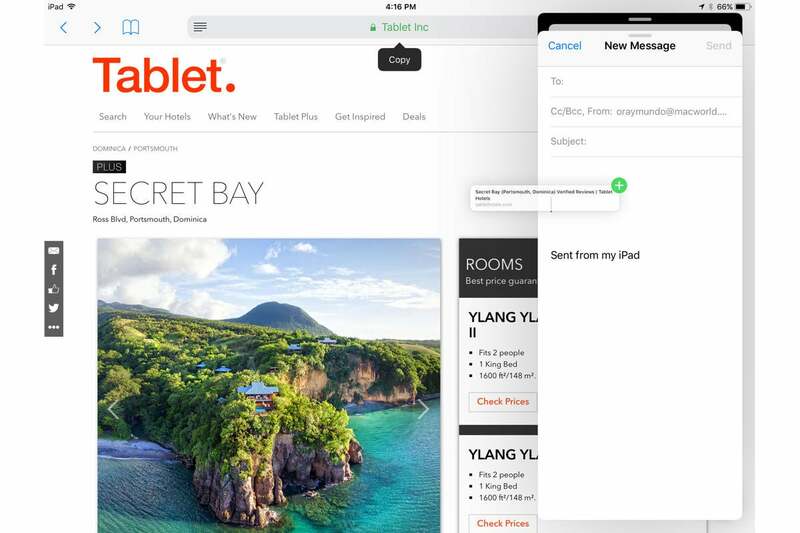 "Likewise, drag-and-drop functionality combined with split-screen will definitely allow users to be more productive, and add more value to iPad Pro users looking to replace their laptop with an iPad Pro." Using iOS 11's Files app, users can store documents in folders, which then become icons – just as they are on a Mac desktop or laptop – and can be sorted by their size, tags or the date they were modified. Those same File icons can also be organized and deposited in Apple's own iCloud or other online storage services, such as DropBox through the same drag-and-drop feature. "I think there are some additions to iOS 11, particularly on the iPad side of things that will make a lot of enterprise users happy," Bassett said.